Add Essential Oil directly to water for a healing, soothing, fragrant spa environment. Spark Your Kid's Imagination with 7 Changing Mood Lights, each of which is adjustable between Bright and Dim modes, and could be set steady on. Great night light for young children scared of the dark at bedtime. Color including: Green, Dark blue, Red, Yellow, Pink, Light blue, White. 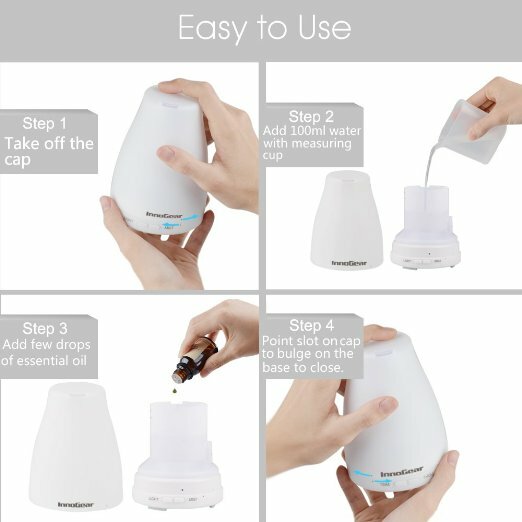 Click the button below to add the Essential Oil - Diffuser to your wish list.